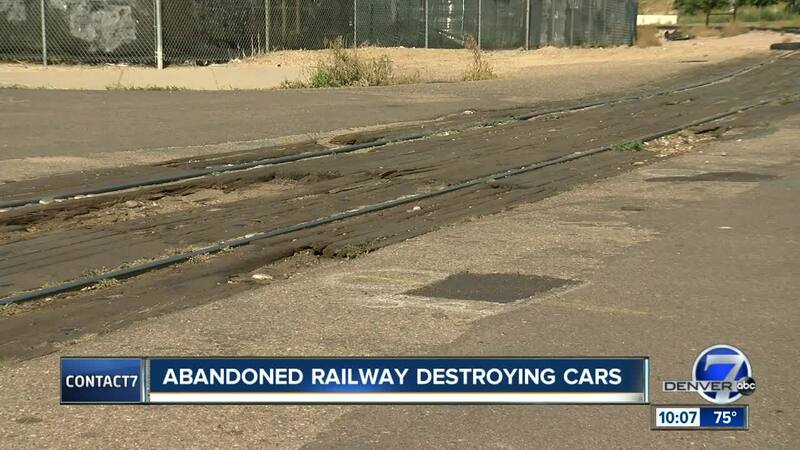 DENVER -- An old, forgotten and abandoned railway is really causing a headache for drivers in the Clayton neighborhood. Flat tire after flat tire, prompted a man to call Contact7 and ask for help finding out why his complaints over a dilapidated stretch of railway, seem to go ignored. You can tell a train hasn't chugged along the track in a while, at the corner of East 39th and Cook Street. Geno Vigil has lived in the neighborhood for 19 years and said he can’t remember when it was last used by the BNSF Railway company. But he and his neighbors have to drive over the decrepit slap of nails, wood and sharp, uneven metal edges, blowing out tires way too often. "We were getting flat tires and they would say they would send somebody out to look at them," said Vigil. “Mostly everybody on this block would get flat tires." He said during the last six months, he's called and complained to BNSF and was told someone would come and survey the crumbling railway. Turns out he was dialing the wrong number, as the City of Denver acquired this piece of railway in June. Denver Public Works spokeswoman Nancy Kuhn explained it’s part of the 39th Avenue Greenway Project that will add more green space and more connectivity through bike paths. "It does not have curb, gutter, better drainage; we are going to improve that stretch. And as part of it, we are going to be removing those railroad tracks," said Kuhn. Vigil wishes he knew that bit of information six months ago. "They never said it's the city's responsibility to look at them," said Vigil. After Contact7 called, street maintenance crews pounded in some of the protruding nails and will consider asphalt to smooth things out until November, when construction begins. “We hope to be able to sort of keep it in a condition that is OK until we can remove that," said Kuhn. If a citizen has an issue with railroads that are not owned by the City of Denver, Kuhn told Denver7 that the resident should still call 311 to report the problem as the city will contact the railway company on behalf of the resident. To file a claim with city of Denver, visit the City Attorney's Office website .